Hair: Cry Ophelia by Exile. Romper + Shirt: Cara capri romper by Yeliz. Necklace: Elemental filigree heart pendant by Elemental Jewelry. Past gift. Bag: Leona bag tropical (clearout pack) by Izzie’s. Hair: Chynna by Truth Hair. Top: Sweater with shirt / Fatpack by Addams. Pants: Everyday brown mesh jeans Cuff by Glace Pearls. Watch: Watch black gold by Swallow. Gift for group. Bag on shoulder: Fox head bag by Zenith. 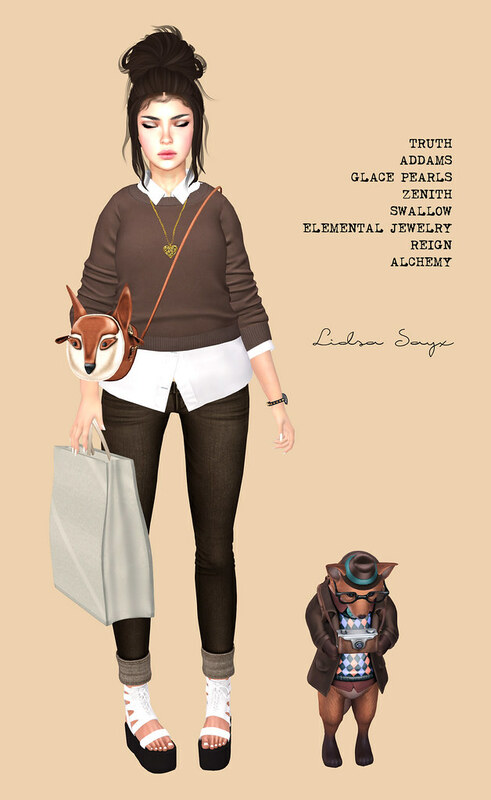 Bag on hand: From inventory – Search for Female City Shopping Bag (SL). Shoes: Bubsies plat white (modified) by Reign. Pet: Fox (Boy) – Companion by Alchemy.